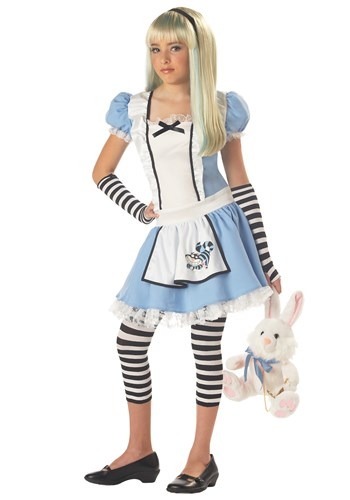 You'll be on your own journey down the Rabbit hole when you go in this tween girls Alice costume! The body of the dress is periwinkle blue polyester interlock knit edged at the neck and sleeves with nylon flat lace. A crinoline edged with the same lace is sewn in under the skirt. There is a white inset panel at center front, edged with black satin ribbon and a self-fabric ruffle, to simulate a pinafore. 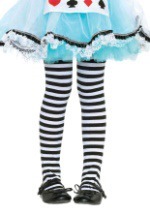 A blue Cheshire cat is printed at the bottom corner of the pinafore. 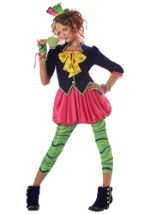 The black and white striped leggings and glovelettes are a poly/nylon blend knit. 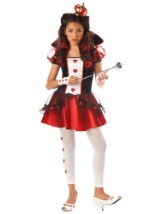 We have lots of fun Alice in Wonderland accessories to finish off this costume!